INDIANAPOLIS (AP) Toronto’s DeMar DeRozan figured out how to beat Indiana at its own game. He sped things up and eventually, the Pacers wore down. DeRozan scored 16 of his 24 points in the second half, Jonas Valanciunas finished with 16 points and 17 rebounds and the Raptors used a 16-4 fourth-quarter run to get past Indiana 106-99 on Thursday night for their 10th consecutive win. The league’s hottest team and the Eastern Conference’s No. 1 seed has won 17 of 18 and moved within one win of tying the franchise record for most consecutive victories, set in January 2016. But unlike so many other wins during the impressive stretch, this one required everything Toronto could muster at the end of a three-game road trip. The Raptors wound up with a 58-35 rebounding edge, thanks largely to Valanciunas and Serge Ibaka, who had 13 points and 11 rebounds. Former Pacers starter C.J. Miles made three 3-pointers in Toronto’s decisive stretch after the Raptors trailed most of the game. And, as usual, DeRozan, led the charge by shooting 8 of 15 from the field, finishing with seven assists and demonstrating the kind of toughness coach Dwane Casey thought was missing the last time the Raptors were in town. For the Pacers, it was a bitter loss. Despite getting 22 points from Darren Collison and a season-high 20 from Al Jefferson and leading most of the game, they couldn’t put it away. The result: Indiana’s three-game winning streak is over and its small lead in the Central Division also might be gone. Indiana took control late in the first quarter and never trailed again until Delon Wright made two free throws to give Toronto an 89-88 lead with 7:02 to go. Back-to-back layups from DeRozan and Wright made it 100-92 with 3:01 left. The Pacers couldn’t get closer than three again and DeRozan sealed it when he stole an inbounds pass and scored on a breakaway dunk with 10.5 seconds remaining. Raptors: Ended a two-game losing streak in Indy. 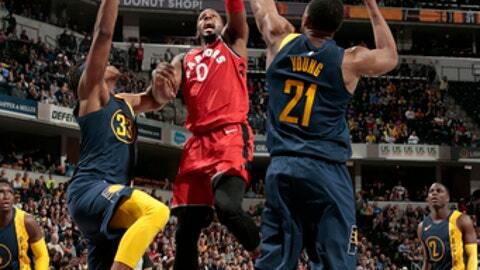 … Toronto is now 2-1 against the Pacers this season. Only two teams – Golden State and Washington – have beaten the Raptors twice this season. … Toronto has topped the 100-point mark in 21 consecutive games, breaking the franchise record set in 2009-10. … The Raptors have a record won eight straight road games and need one more road win to match the franchise’s single-season mark (24). … Valanciunas has scored in double figures in a season-best nine straight games. Pacers: Victor Oladipo scored 18 points and had three steals, extending his streak of consecutive games with at least one steal to 52 – breaking a tie with Allen Iverson for the 10th longest streak in league history. … Thaddeus Young had 13 points and Lance Stephenson finished with 10. … Jefferson also had 12 rebounds. … Indiana had a moment of silence before the game for New Orleans Pelicans owner Tom Benson, who died earlier Thursday. Toronto played without guards Norman Powell (sprained left ankle) and rookie OG Anunoby (sprained right ankle). But the Pacers may have come away even more short-handed. Backup center Domantas Sabonis sat out with a sprained left ankle and starting center Myles Turner left late in the first half after spraining his left ankle. While Turner returned in the second half, he was ineffective. The Pacers also expect Sabonis to miss at least a few more days. ”He won’t play tonight or Saturday and we’ll re-evaluate, probably next week,” McMillan said before the game. Raptors: Host Dallas on Friday after a three-game road trip. Pacers: Visit Washington on Saturday.